As most of you probably know by now, the HTC One X for AT&T packs a different chipset than its NVIDIA Tegra 3 rocking, global sibling. A Qualcomm made, Snapdragon S4 chipset with two CPU cores is the reason for the US available HTC One X’s LTE connectivity. This means that testing out the battery life of the two HTC One X versions is the perfect showdown of the battery efficiency, which the latest and greatest Qualcomm and NVIDIA chipsets offer. Read on to find out which one came on top. As always, we’ll kick things off with a look at the talk time of the handset. The HTC One X for AT&T managed the highly impressive 10 hours and 35 minutes before its battery gave up – a result which is better than the showing of the quad-core packing global version, though not by much – the difference is around 5%. The web browsing time showed a similar state of affairs. The Qualcomm equipped HTC One X outdid its NVIDIA packing sibling again, this time by about 15%. We will remind you again that despite its dual-core nature, the One X for AT&T is not slower than the global version, as its chipset features a newer architecture. Video playback time was no different. With a time of 6 hours and 26 minutes, the HTC One X for AT&T once again bested the global HTC One X, and it’s again by a margin of about 15%. The result from both phones are not stellar to begin with, but keep in mind that those 1800mAh batteries power 4.7″ screens with HD resolution. 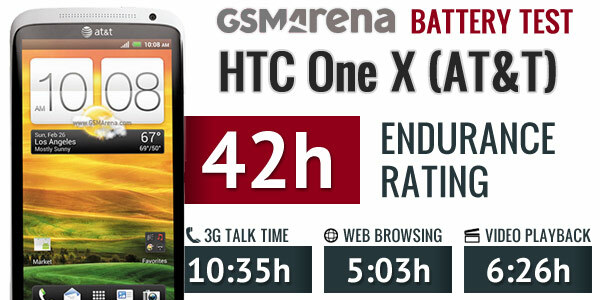 The total endurance rating of the HTC One X for AT&T was 42 hours. This means that the device will last a tad less than two days if you use it for an hour each of telephony, web browsing, and video playback every day – not bad for a power-hungry top-of-the-range Android smartphone. In a nutshell, the HTC One X for AT&T is powerful and power efficient. Qualcomm’s latest Snapdragon S4 chipset is a massive improvement over its predecessor in terms of energy efficiency. With the LTE radio being an integral part of chipset, rather than an addition, it shows that 4G data speeds shouldn’t come at the expense of the battery performance anymore.